Pre-requisite – Completion of our Beginners Fusing & Slumping (Plate Making) Workshop. 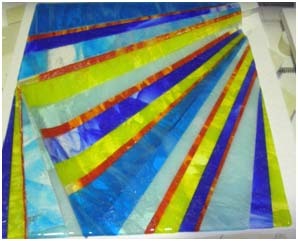 You will be making 2 glass pieces of your own design and shape using opaque and transparent glass. Kiln carving using fibre paper and the use of inclusions will be part of this workshop. You will need to attend the studio prior to the class to discuss your design, choose your glass and mould shape. This can take 1-2 hours. Please come armed with any images that appeal and ideas of colour that you may wish to match. ** bookings are essential for all workshops. *** the workshop schedule is subject to change. Other Workshop Dates can be viewed here.